Devin's most anticipated ebook in years is finally here. He shows magicians how to get on the first page of Google searches and win out over your local competitors. The Google search engine has become the most important tool in the world today for getting bookings. Yellow pages are quickly becoming obsolete with performers bemoaning that the yellow pages are no longer getting them results. Statistics show that 97% of consumers now search online for products and businesses. If you are an entertainer and NOT listed on the first page of Google when people search for a performer in your area, then you might as well not be in business. Ranking on the first page of Google nowadays is crucial to any performer wanting to get steady bookings. Entertainers know this and wind up paying hundreds, if not thousands dollars a year buying Google AdWords, so they can be seen on the first page of searches for entertainers. This gets to be very expensive, especially if you pay for a click and don't get a booking for it. Devin Knight, an SEO (Search Engine Optimization) expert, strips away the veil of secrecy and reveals the secrets of appearing on page one of Google searches WITHOUT BUYING ADWORDS! Devin will give you proven techniques to rank your website on page one of Google within 24 hours. No need to wait weeks or months, these techniques will land you on the front page within 24 hours! Even if you don't have a website, Devin will show you how to appear on Google's first page with a description of your act, photo, e-mail and phone number, and you can achieve this in 24 hours! In every case you will find Devin Knight is listed for all these categories on the first page and NONE OF THE SEARCHES INVOLVE HIS NAME!!! NO EMPTY PROMISES. You can achieve the same results, if you follow the steps in this ebook. SEO firms change anywhere from several hundred to several thousands dollars a month to get a business on the front page of a Google search. Devin himself, charges $100 per hour to consult other performers on how to rank on page one. Now you can do it yourself with this easy to follow guide. Although this ebook was written mainly for magicians, any entertainer can use the techniques to get on the first page of Google searches. Take your career to the next level, get more shows with a front page listing on Google. It is easier to do than you think. 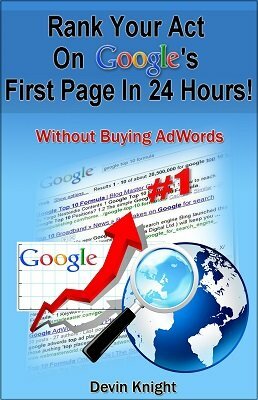 Stop spending hundreds a dollars a year on Google AdWords when you can get on the first page naturally. All you need is this ebook. Magicians, Mentalists, Clowns, Jugglers, Dancers, Comedians, Hypnotists, Singers and Musicians can all benefit from the information in this ebook. 1st edition 2013, 34 pages.